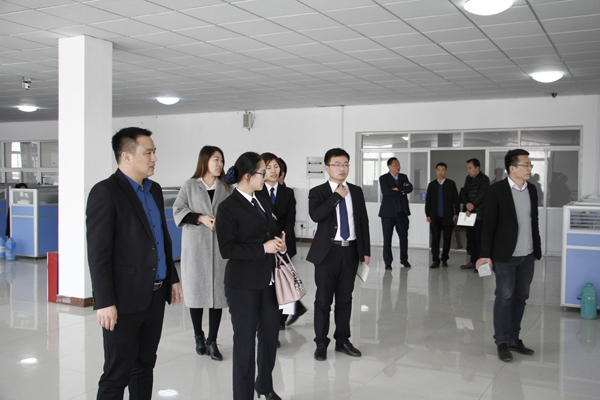 On the afternoon of March 20th, Shandong Tianyi Machinery Company Client Manager Ren Meili, International Trade Manager Liu Chungang visited Shandong China Transport Group, to strengthen industrial cooperation, cross-border e-commerce platform construction and other aspects. China Transport Group Executive Vice President Han Yong, Li Zhenbo, China Transport Group E-Commerce General Manager Yan Ting, Cross-Border E-Commerce Company Deputy General Manager Jiang Chaoxiang and other leaders accompanied reception. Shandong Tianyi Machinery Company leaders accompanied by Executive Vice President Li, visited the group e-commerce companies, cross-border e-commerce company, network information company, software technology company, Weixin agricultural technology company and Kate intelligent robot company, watched and given high praise to live demonstration of high-tech unmanned aerial vehicles and intelligent robot which independently researched and developed by Shandong Kate Intelligent Robot Co., Ltd., branch company of China Transport Group. At the symposium, Executive Vice President Li briefed introduced the development achievements of China Transport Group in various fields such as e-commerce, cross-border e-commerce, large data platform construction, software development, intelligent machinery manufacturing, unmanned aerial vehicles, etc. and highlighted successful experiences in the cross-border e-commerce platform construction and operation. Shandong Tianyi Machinery Company gave a high evaluation to group of e-commerce sales model through the visit to give, and said that Shandong China Transport Group transformed to Shandong Provincial machinery industry's largest e-commerce leading enterprise from the traditional industrial enterprise, build a benchmark for provincial enterprise information transformation development, her successful transition experience is worth every traditional business to study from. We are no to learn this time, but also hope to reach depth of cooperation with China Transport Group to strengthen product and equipment sales, trade exports, industry integration, power platform construction and other aspects, the two sides to achieve a win-win business development through complementary advantages, strong combination! Executive Vice President Han said that China Transport Group, as the president unit of Jining City Electronic Commerce Association, is very willing to join with more industrial enterprises to explore new e-commerce development ways in Internet + era, we not only to cooperate, but also to broaden the channels of cooperation, to enhance the level of cooperation, China Transport Group will make full use of unique innovation and development advantages of national integration of informationization and industrialization, and share successful experiences, to play an exemplary role, better lead provincial rapid development of e-commerce!